What happens when you invite seven women bloggers from diverse areas of the United States to discuss the merits of Amazon’s new Kindle Paperwhite? I mean really discuss—together as a group—despite their geographic limitations? This video of the Viewpoints Blogger Review Panel represents our first-ever Google Hangout chat, which took place on Tuesday, November 13, 2012. Carol Fowler, vice president of content for Viewpoints, moderated our discussion and recorded it live, as it happened. You’ll see and hear us address such aspects of the Paperwhite as its battery life and overall durability, the touch screen and its readability—even the colossal Amazon library. It will probably take you about 35 minutes to watch the video, so feel free to come back later if you’re short on time. Reading with the Paperwhite is, I imagine, like driving James Bond’s Aston Martin DB5, had it been manufactured five minutes ago: smooth, sleek, and with all the latest gadgetry. Reading with my old Kindle is like driving the first car I ever owned: my grandfather’s 1964 Chevrolet Biscayne. No power steering, no power brakes, no power anything really except for a gigantic motor. The differences are that substantial. As you might have gathered, I own a Kindle Keyboard—John bought it for me for Christmas two years ago—and last year I wrote a post about the experience of reading books versus the Kindle. If you’d like a side of context to go along with this review, please feel free to check out that earlier entry. I’ll be glad to wait for you. You’re back? Okay. Good. Now before I give you my rating, I’d like to highlight one aspect of the Paperwhite that impressed me so much that I’ve illustrated it here with a graphic. It’s the social media sharing function—an incredibly cool feature that the Kindle Keyboard apparently has as well, but I never noticed it and therefore never used it. Say you’re reading and a wonderful quote or passage just begs to be passed along to your friends. I experienced this many times while reading Arianna Huffington’s On Becoming Fearless: In Love, Work, and Life. I dragged my finger across the Paperwhite’s touch screen to highlight the text I wanted to share, synced up with my Facebook account, and voilà! 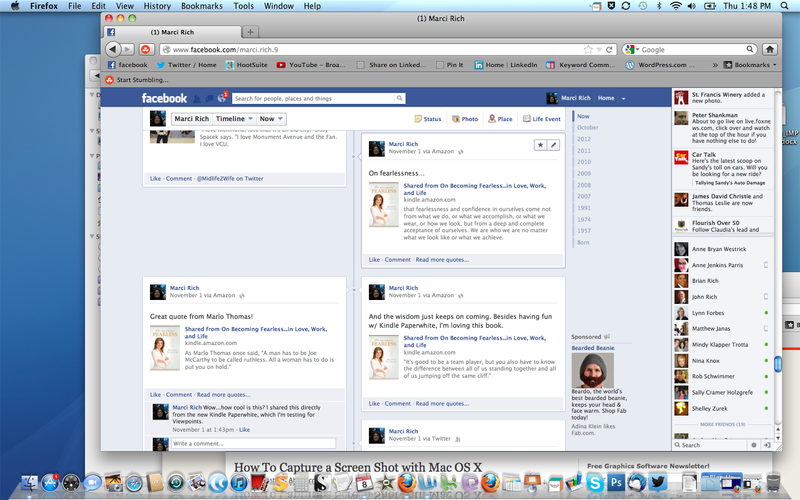 You can see the three quotes I shared on my Facebook page by clicking to enlarge this screen grab. What do you think? By all means, join the conversation by leaving a comment below! Okay. Enough preamble. You’re busy. Maybe you’re one of those cut-to-the-chase kind of people and you just want to know whether or not I recommend the thing already. Okay. I’ll tell you. I give it five gold rings. One of the ways in which Viewpoints ensures the honest and impartiality of our reviews is to require us to donate the products that we test. 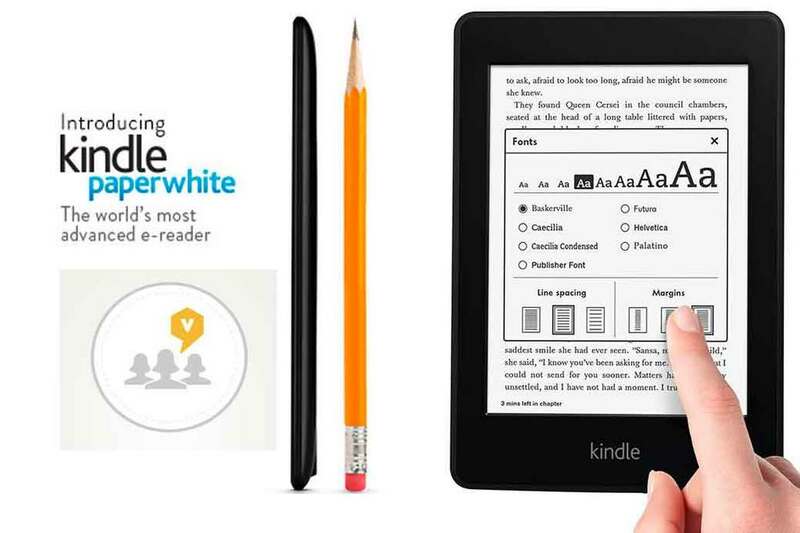 I’ll be donating the Kindle Paperwhite to the Richmond Public Library. Now before you go I have one small favor to ask you. if you do plan on buying a Kindle Paperwhite as a gift this holiday season, and I think that’s a fine idea, please also stop by your local bookstore and pick up a book or three. I say this to you as a bibliophile, as a reader, and as a writer—credentials I hope I’ve established during the time you’ve spent with me here. And tell your bookstore owner that The Midlife Second Wife sent you. Thanks! Happy holiday shopping!